Working with digital images generates an enormous amount of questions - even from seasoned professionals ? but help is here at last! 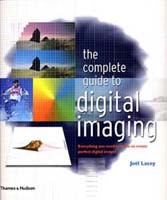 Comprehensive, detailed, but easy to follow, The Complete Guide to Digital Imaging is both a manual and an inspirational guide to achieving stunningly produced digital images. It is essential reading for all those involved in image processing, whether in digital photography, print, Web output, animation or video. Through myriad examples, detailed technical information and practical work-throughs, this book resolves the many mystifying technical issues involved in the creation, manipulation, processing and output of digital images.